Police officers and environment officers from Hounslow Highways teamed up with Hounslow Council in a clamp down on litterlouts. Officers patrolled Brentford and Hounslow high streets looking out for anyone dropping litter recently. 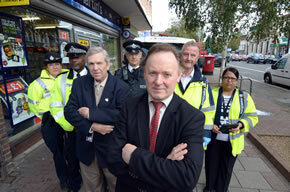 Cllr Ellar and Cllr Mel Collins with team of officers from Hounslow Police and Highways in Brentford. Councillor Colin Ellar, deputy leader and cabinet member for environment, said: “Hounslow Highways and the council are working hard to keep the borough clean and with over 800 litter bins across the borough there is simply no excuse to spoil our streets. The clampdown on litterlouts will continue throughout the borough.